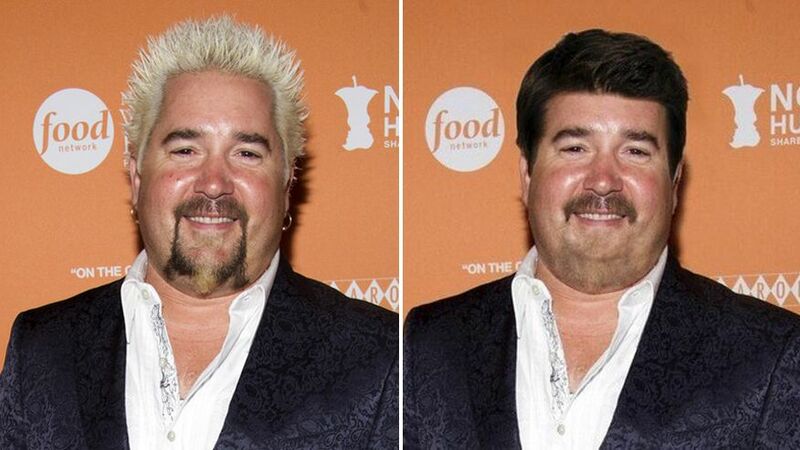 Let me start out by saying that I’m very uncomfortable with how much Guy Fieri with a normal haircut looks like me. 10 years ago, looking anything like him was not a crime, but he’s so legitimately awful that he’s basically ruined even looking like him a little bit. He’s also made it so I say things like “Flavor Town” whenever I think of the word “flavor” because he ruins basically everything he touches. Seriously this guy is the worst. It gets so much more casual than EDH players. Some finance advice I used to give back when trading wasn’t entirely killed by every jackass installing a cellphone app that makes every trade take an extra 10 minute while they type every card in then try to get an internet signal in a gigantic convention center thinking they can’t be sharked when they can totally still be sharked, was to find casual players where they live. Smaller LGS locations in your area. Community Colleges. Their home kitchen tables. Actually, that last one is a little tough. You can just knock on every door in town hoping to find a game in progress but your odds off success are going to be really low. I used to have a Craigslist ad looking for casual Magic players but after one too many unsolicited dicktures, I took the ad down. The point is, once you find casual players, you should trade with them because it’s literally the best. I Feel Like This Will Get You On a Tangent, but Why Trade With Casuals? Because the stuff they value is unlike anything other groups value, the way they value it is unlike any way other groups value it and they’re always happy with every trade. You could pull a casual player’s pants down for $50 on a trade and they will do a cartwheel for joy and you will feel bad for ripping them off and you’ll feel even worse for not being as happy as they are. Don’t rip people off. It’s not worth it and you don’t even need to do it. If a casual player is happy to trade you a Verdant Catacombs for a Ludevic’s Test Subject, why not give him a Verdant Catacombs worth of weird octopus crap? It’s clogging up your binder and you’ll make his entire day. Now this is not to say all casual players are durdles or don’t trade cards by monetary value or that they’re easy marks or anything derogatory. The simple truth is that people who play Magic casually have more fun that you ever will because the things you have been conditioned to think are important don’t matter to them for the most part. Their octopus and sea monster deck only has to be good enough to beat their friend’s Thallid deck roughly 50% of the time. There are people out there who don’t quite understand why everyone acts like Tarmogoyf is such a good card. Find that guy. Spend time with that guy. He will teach you how to enjoy building decks and playing for no prizes. He’ll teach you to enjoy this children’s card game that you have ruined for yourself by treating it like a commodities market, you cynical, money-hungry fun-hater. 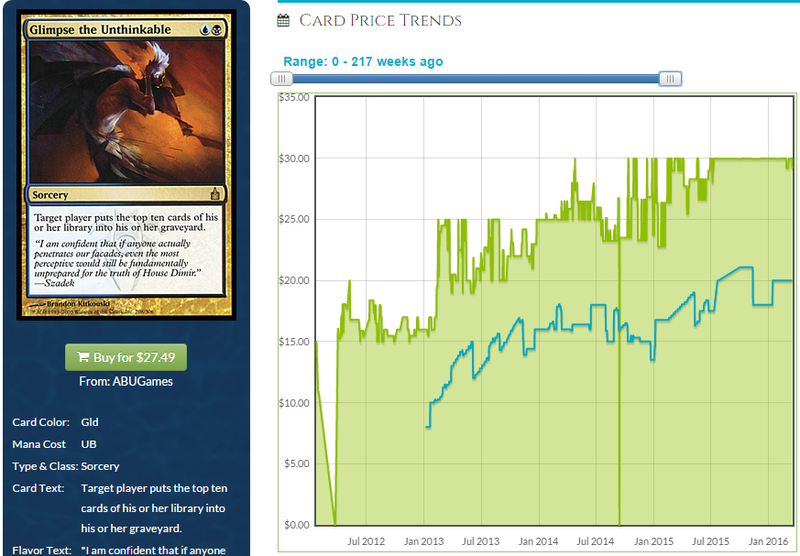 Casual players by different cards and they buy the same cards differently when compared with an EDH player. I’m not saying that they buy differently because they bust hella packs at Walmart trying to get a card instead of paying a quarter as much money and just buying the card on TCG Player although that does happen. I’m not saying they say “I went to BOTH card stores in town and neither one had it. Now what am I supposed to do?” although that does happen. I just mean they tend to buy playsets of cards and that means cards with casual appeal can spike four times quicker than a card with equivalent EDH appeal only. That’s fairly obvious, but it’s worth reminding ourselves of every once in a while because while it seems trivial that people buying cards four at a time can spike a card four times faster, we don’t always stop to consider which cards can shoot up in price on this principle. We should. When you consider how easy these things are to see coming sometimes, we really, really should. What do Casual Players Like? First of all, casual players like slow cards. Until EDH became a thing and insane mana ramping plus people leaving each other alone for 5+ turns became a thing, casual players were the only ones playing slow enough game for big, huge durdly creatures to hit the battlefield. You’re going to die to 4 tokens and a Hellrider on turn 5 with that Palladia Mors still in hand at FNM but at home on the kitchen table, he’ll live long enough to get suited up with all 4 of your Armadillo Cloaks before you decide to attack someone with him. Again, casual players aren’t all durdles but that isn’t to say they don’t like durdle cards. I mean, we as EDH players like durdle cards, too so let’s not pretend we can pass value judgments. 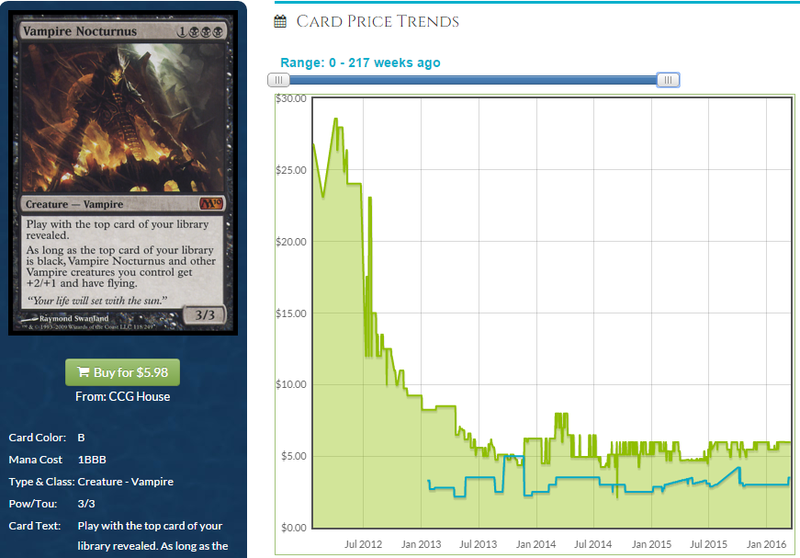 If it weren’t for EDH and casual, only like 100 Magic cards would be worth money and the rest would be junk. It’s not Modern players making Glimpse the Unthinkable do this. Which brings me to the next thing casual players love – Mill. Mill’s not great in EDH. Liiiiiiike at all. I have seen some pretty funny Phenax mill decks with cards like Eater of the Dead but for the most part, you don’t want your opponent starting out at 92 life, I don’t care if your damage spells do 10. Mill cards are expensive, though. Really expensive. 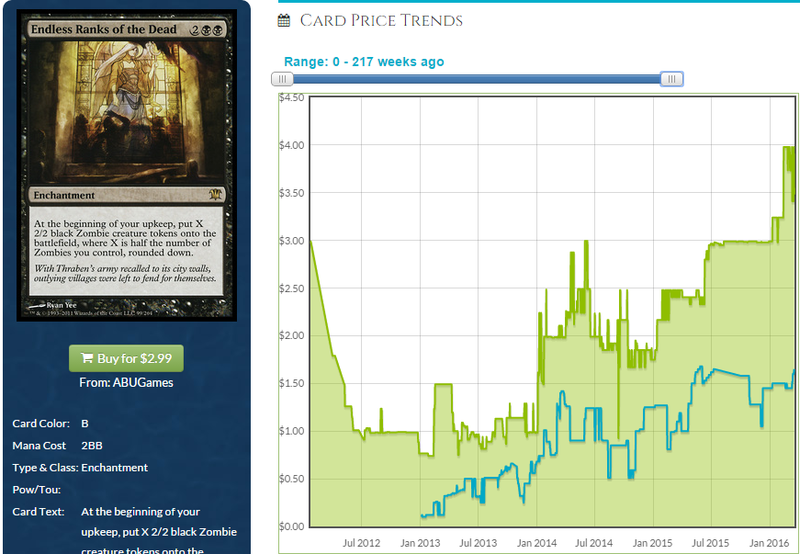 Before Modern Masters, Mind Funeral was actual dollars. Why is that? Well, it’s not EDH players doing it and it’s not competitive players doing it. Who does that leave? Lots of unsleeved copies of Glimpse the Unthinkable are getting pulled off of a topdeck and getting pointed at 73 card decks. Milling is fun but it’s not very often all that competitive. Playing Magic for fun like we should all be doing but refuse to means you get to play fun cards like Glimpse the Unthinkable and even if you’re a casual player that doesn’t mean you’re a poor. They get a few bucks together and they buy Glimps the Unthinkable and it does the Unthinkable. It ends up worth more money than Glare of Subdual and Concerted Effort and Doubling Season and all of the cards that EDH players think are so much better. EDH can do a lot of things, but it can’t make this card nuts. But casual can. Finally, casual players love tribal stuff. EDH players do, too, but a casual player won’t let a little thing like “There’s no Legendary creature that buffs these guys” stop them from building the deck. Casual players didn’t wait for General Tazri to come out to build an ally deck. Oh you best believe they had an ally deck. How does knowing this help us get ahead of spikes? Well sometimes playability is only half the battle. Sometimes cards go up strictly based on their flavor. Yes, I waited 1300 words to get to my thesis. Chill, you had an enjoyable journey so far. Two players see the same card. We’ll call the first player “player C” because he’s a competitive player. Player C looks at this card and he’s blown away by its playability. “Holy zombie balls,” says player C, “this card is busted. You can recur him for as cheap as Gravecrawler without the requirement to have other zombies in play. And you can bring back other zombies, too? This is amazing. I want this in a dredge shell, or maybe paired with Goblin Bombardment in something. This is going to be $20+ easy.” Player C is understandably very excited by this card and he saw everything he wanted to see. Another player is casual so let’s call him “player C” because he’s a casual player. Player C says “Do you see the background of this card? It’s clearly a few minutes after the art from Endless Ranks of the Dead! The zombies are all climbing into the church and this one is leading the way! How cool is that, closing the loop on this years later? Did they plan it, or did they revisit the old art when they got the new assignment?” Player C is very excited because the art from another card is represented on this one. Something curious happens. The price of a card that isn’t Standard legal starts to climb and it’s in no small part due to people being reminded that it’s a card because a new card has its art on it. It may be a bit of an oversimplification to say the art connection is the sole impetus for the increase but it’s a factor. 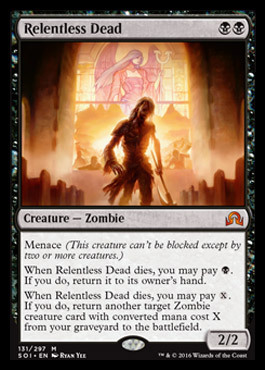 EDH zombie decks aren’t getting much so far from the spoilers we’ve seen so there’s no real reason EDH players are going to run out and buy a ton of copies of this. Yet the price jumped and it hit a historical high and this card isn’t done growing yet. I think Army of the Damned showed how devastating a reprint can be for a card like this, but I think the reprint risk is lower here and even though EDH players aren’t going to make Endless Ranks climb, casual players are not done spiking this. So how do we get ahead of what’s going to go up? It’s fairly simple. You already know what casual players like because there is a casual player in the heart of us all. Vampires are in this set, so any older relevant vampires are worth a look. Do we have a vampire lord? We do? And it’s at a historic low? Will the non-foil versions be held down by the price of the foil media inserts? Maybe. But casual cards tend to not follow traditional rules and usually whichever copy is chepest sells best. Am I investing a ton of money into Nocturnus? No, I tend to speculate on EDH cards. But this isn’t exactly a tough spike to predict, is it? New Vampires means old ones get a look. Old ones like this other one, also. Casual players like good cards, guys. That’s what we need to remember. Captivating Vampire is a good card. Vampire Nocturnus is a good card. No one is really playing those cards because they don’t have much of a home in EDH, Standard, Modern, Legacy or Vintage. Even though I listed basically all of the formats, casual isn’t a format, it’s a lifestyle. 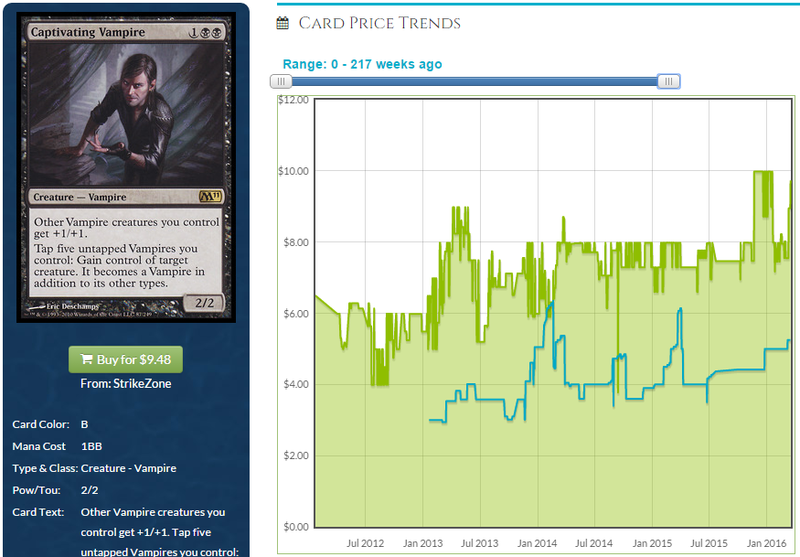 This lifestyle is all about spiking Captivating Vampire up to $10 while everyone was distracted debating what a second Modern Masters printing was going to do to the price of Tarmogoyf. Look at spirits. Vampires. Werewolves. Zombies. Chances are there are a few cards with upside. While I don’t think EDH is a primary driver here and I cautioned against throwing too much money at Mayor of Avabruck last week because we can’t really quantify how popular werewolves are going to be using tools like EDHREC, there are cards that historically go into casual decks and it would be silly if we ignored casual as a format just because it isn’t one. 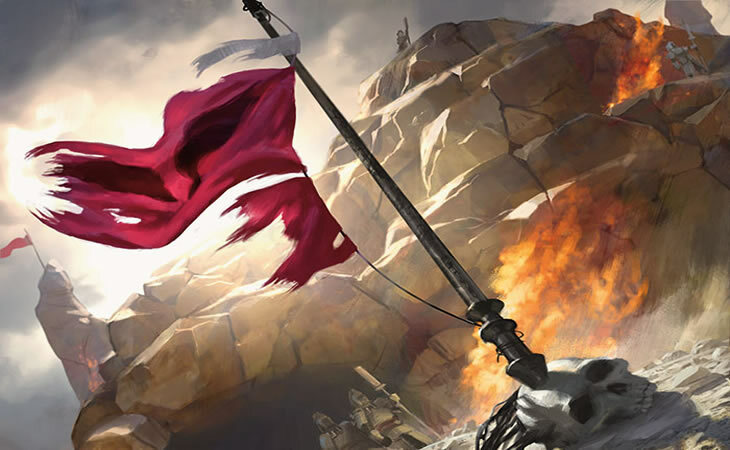 Keep your eyes peeled for cards like Immerwolf and Drogskol Captain moving forward. If you made money on Drogskol Captain in 2011, thank Jon Finkel. If you make money on it in 2016, thank a casual player. They’re the only ones who even get on the bus to Flavortown anymore. Jason i think this has to be your funniest arricle for a little while! I genuinely spilt my coffee as i read it laughing away. There were some great points in there too. In my LGS trading is still alive so i get to trade with plenty of casuals and i love to make their day by trading a ton of cards they love for shocklands, fetches etc. Makes my day and theirs and i feel no need to rip anyone off, never have, never will. Oh, please tell me you dont wear tour sunglasses on the back of your head? I enjoyed this article a lot, right up until you called both players “Player C”. It was too easy, and as I’m scrolling down I’m like “don’t do it, don’t do it, be more creative”. lol. I kinda expected “Player C” and “Player c” but ce la vie. Very good and enjoyable article. It’s easy to understand why players LOVE Innistrad and are so excited for Shadows, Relentless Dead is just one example. You are 1000% correct, phenomenal art, phenomenal nod to the original card, and a mythic rare with abilities (I think over priced financially but whatever). Anguished Unmaking, another card that just oozes flavor, is actually good, and makes sense as a card and in the lore. Lesson learned, drop the goyfs for duals all day. I really liked your article, and I L-O-V-E flavor! I always have, but I’ve also never been a real competitive player. I usually end up just trading at events ^_^, and the most important part of the game to me has been the stories. I started getting heavy into misprints a while ago, and to be honest, the primary thing that sparked my interest were 2 major errors that showed up in a fat pack booklet and a novel that I purchased. The story is just as important as the cards themselves, and we should be reminded of that occasionally.